Ok, this recipe is not in any way paleo. Not even close. That said, despite the fact that I have been mostly paleo/primal for the last 2 years this blog gets more traffic from my bread recipes (see here, and here) than anything else. So, for those that want great gluten free bread that is better than anything you can find in a store, that is moist and tender and doesn’t have a grainy texture or fall apart if you look at it funny, here it is. This is a slightly sweet bread and is really nice for a change. I hope you enjoy as much as I did. Preheat oven to 200 degrees and then turn it off keeping the oven light on. Heat water (it needs to be pretty hot because when you add it to the eggs etc it will cool down considerably. After adding the water to your other wet ingredients you want the temperature to end up being about body temperature.) Add cranberries to soak for a couple of minutes while you get the other wet ingredients assembled. In the bowl of your stand mixer add the eggs, melted coconut oil and honey and mix well. Add water and cranberries and yeast and stir until combined. Let it sit so the yeast will proof while you assemble your dry ingredients and prepare your pans. Using mini loaf pans lightly grease with coconut oil and then line with wax paper. This doesn’t have to be pretty or exact. It won’t matter in the end. Roughly trim the edges of the paper so it doesn’t hang over the sides too far. In a large bowl sift all of your flours with the xanthan gum and salt. When your liquid ingredients look all foamy add the dry ingredients with the mixer on medium low. Mix well. Scrape down the sides. Mix on medium speed for 2-3 minutes until well combined. Add pecans and mix through. Divide the dough between the two pans. Coat your hands in melted coconut oil and smooth the tops of the loaves. Make sure your oven is turned off with the light on and place the pans on the middle rack to rise for 25 minutes. When the time is up turn on the oven to 350 degrees and set the timer for 38 minutes. No need to pull the bread out to pre-heat the oven. When they are done remove from oven and let cool on the counter top, in the pans. When they are cool enough to touch you can remove from the pans and slice and serve. 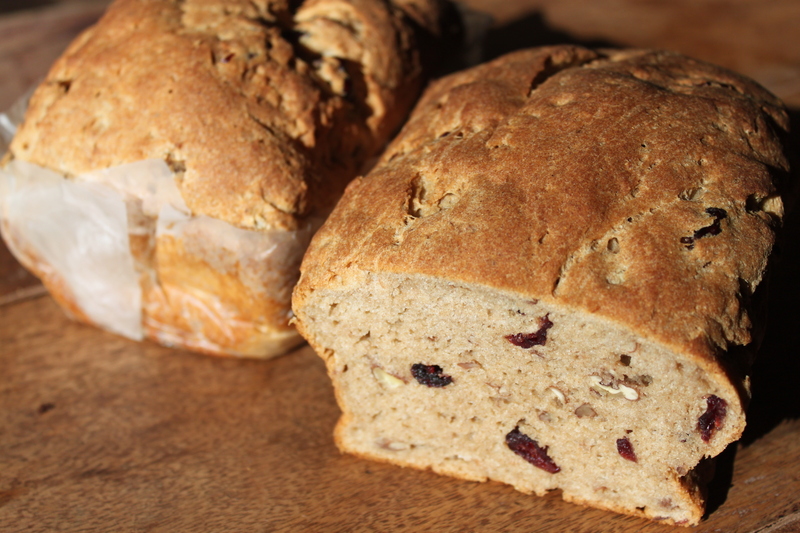 Do you know what makes some gluten free breads so crumbly, especially after freezing? I found that upping the oil slightly seems to help a bit. Thanks for your great recipes! So nice to see you post again—I’d wondered where you went! This looks wonderful, will try it next week and post the results! 😀 I’m still here. I’d love to hear how it turns out for you. Have you tried this with Potato starch as you did in your Whole Grain Bread recipe? I always found with my wheat breads that Potato starch and buttermilk were key to perfection in making breads. I have. I like potato starch too. I use both.